Here’s a quick chicken curry for any weeknight dinner. 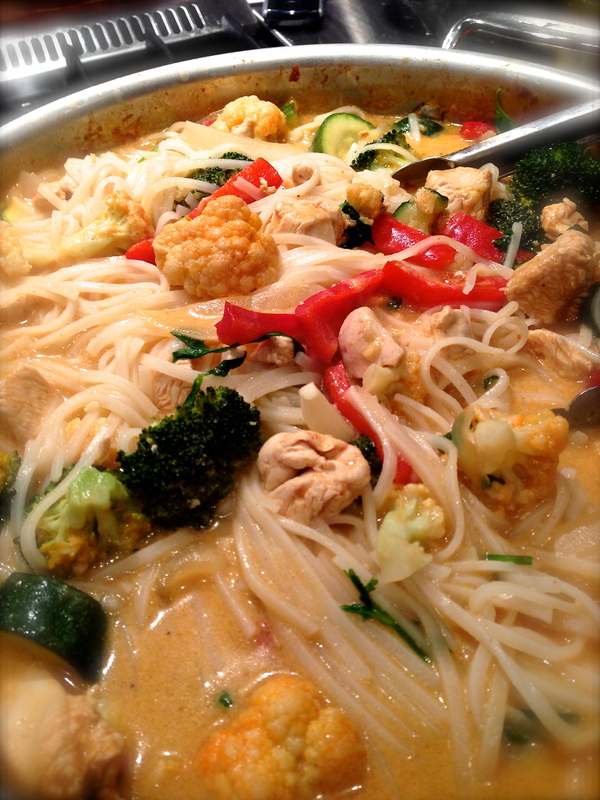 We love Thai red curry and always order it when we go to our local Thai place. I don’t think Thai take out travels very well. We usually eat it there. This simple dish allows you to make it at home, and tastes like your Thai restaurant curry. I don’t recall where the original recipe came from. I’ve made this a few times, tweaked it, and here’s the result. The dish requires a little prep work. Get all your veggies and ingredients ready to go, and place them next to your stove before you start cooking. You can also use fresh green beans, or even a little fresh tomato would be nice. Just select the veggies that look best at your market. Any combination will be delicious and you can’t really mess up the veggie quantities, the more the better. In fact, change out the chicken stock for vegetable stock and omit the chicken and it would be a fantastic vegetarian dinner. I always associate cauliflower with curry dishes, so that’s one veg I would make sure to include. * I use one can of lite coconut milk and one can of regular. It’s very rich and high in fat. I don’t recommend using 2 cans of lite. It’s too watery to make a proper sauce. Combine the brown sugar and fish sauce in the small bowl, set aside. In a large pot, heat water to bring to a boil for your rice noodles, so you’re ready to prepare them while your chicken is simmering. Add the canola oil to a large dutch oven over medium-high heat. Saute the garlic and ginger until fragrant. Add the curry paste, stir and add 1/4 cup chicken stock, cook for 1 minute. Add the broccoli, cauliflower, red peppers, zucchini and onions – cook, stirring frequently for 3 minutes. Place the chicken in the pot, season with salt and pepper, allow to cook stirring for 3 minutes. Pour in the coconut milk (remember to shake the cans before opening), add the remaining chicken stock and the fish sauce mixture. Stir to combine and simmer 10 minutes or until the chicken is properly cooked through. While you’re waiting, cook the rice noodles according to package instructions. 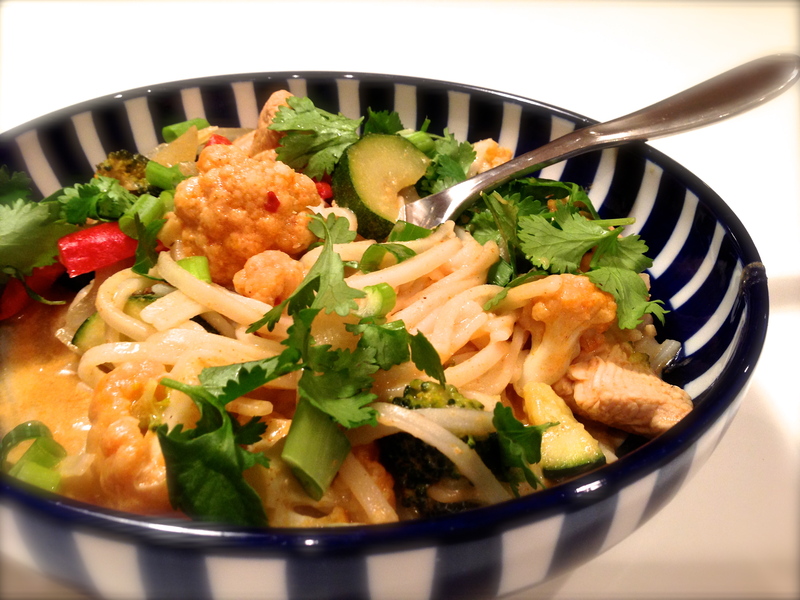 When chicken and vegetables are ready, add the cooked rice noodles, lime juice, cilantro, basil and scallion greens. Toss together and serve with additional lime wedges.